Michel Platini is confident Ukraine and Poland will be ready to host the European Championships in 2012. 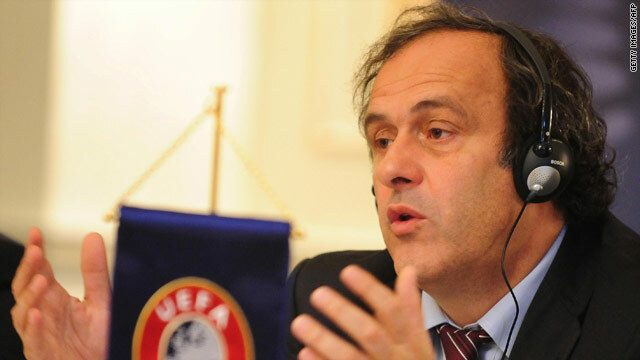 (CNN) -- UEFA president Michel Platini has stated that he believes Ukraine and Poland will be ready host the European Championships in 2012. The four Ukrainian cities - Kiev, Donetsk, Karkov and Lviv -- have all been chosen to host matches at a UEFA executive committee meeting in Funchal, Madeira with the final in Kiev on July 1, 2012. Poland will host games in four venues at Warsaw, Wroclaw, Poznan and Gdansk with Platini confident that the infrastructure and organization in both countries up to the required standards. The UEFA president had raised concerns about the progress made in Ukraine in May this year but after the latest report he is confident both countries will be ready to stage the confederation's showpiece event. Platini told the UEFA Web site: "Around three years ago we entrusted the organization of the Euro 2012 to Poland and Ukraine. "This wasn't merely a whim but a strategic plan to open up our flagship competition to Eastern Europe. "The work is not finished. UEFA experts will obviously continue to work with the two countries towards the final tournament." "In September, we had to reserve our opinion on three of the four candidate cities in Ukraine in particular and considerable progress needed to be made. "We knew it was going to be a difficult undertaking, that there would have to be investment in infrastructure, in the stadiums, in transport and hotels. "Poland and Ukraine have done all that despite the global economic crisis which has hit them hard." Platini added: "The work is not finished. UEFA experts will obviously continue to work with the two countries towards the final tournament."